After considerable fiddling, I’ve finally managed to update the phylogeny and host-association matrix for the most common lichen photobiont, Trebouxia. The methods are similar to those used in my previous post on Nostoc rbcX sequences, to the extent that the same script can used to run both analyses. It was modified to use algal species names rather than host names when analysing Trebouxia, to colour the clades in the tree, and to count the number of times each photobiont lineage has been sampled from each lichen genus. All the steps required for this analysis can be see here. All of the files that were generated are available here. I had previously built a tree from 1840 ITS sequences and identified lineages corresponding to ten named species and five unnamed species. Since then, there have been a number of important papers that have expanded the known diversity of the group and begun to codify the novel lineages. My current ITS tree (PDF version here) has 2335 sequences and includes 12 named species and 12 informally named lineages. Most of the names match those of Muggia et al. 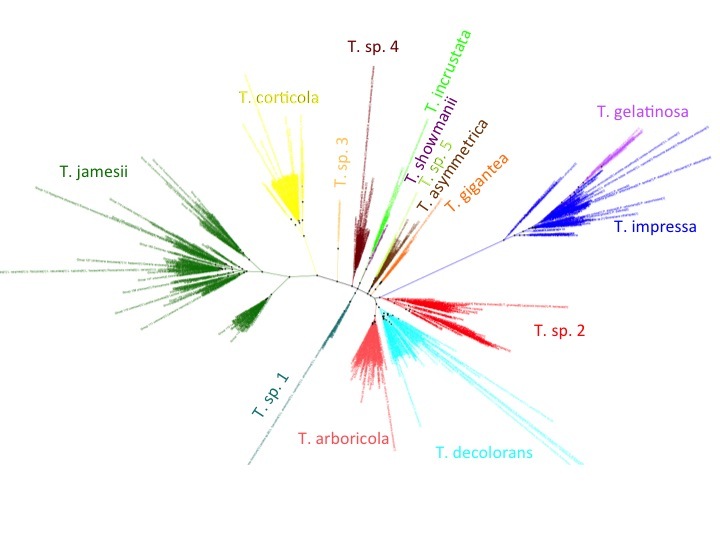 2014, except that T. incrustata is circumscribed more tightly. Also, what they called T. arboricola/T. decolorans is T. decolorans in my tree and what they called Trebouxia sp. 1 is T. arboricola. The informally named lineages include two clades (URa1 and URa3) that were identified by Ruprecht et al. 2012, primarily from Antarctic lecideoid lichens. A third primarily Antarctic group, URa2, formed a paraphyletic assemblage basal to the clade that includes T. gelatinosa, T. impressa, T. incrustata, T. showmanii, T. gigantea, T. assymetrica, T. decolorans, T. arboricola and several informally named lineages. This is a similar arrangement to that of Muggia et al., except that T. impressa and T. gelatinosa were not included in this “crown group” in their phylogeny. This URa2 group was monophyletic in my previous tree (Trebouxia sp. 4), as well as in some of the other analyses that I ran for this post. URa2 was also present in my previous analysis, and named Trebouxia sp. 1. Trebouxia sp. 2 from my previous analysis corresponds to the clade including TR1 and TR9 lineages from Casano et al. 2010. The other two clades that I identified previously are also distinct monophyletic groups in this tree (Trebouxia sp. 3 is basal to T. impressa/ T. gelatinosa and Trebouxia sp. 5 is basal to Trebouxia sp. clade V / URa3). URa1 branches within what I labelled as T. jamesii in my previous analysis, breaking it up into three distinct lineages. One of these has been previously identified by Kroken and Taylor 2001 as T. jamesii ‘letharii’. The other appears to be novel and is called T. jamesii 2 here. Clade BMP1 from Leavitt et al 2013 forms a paraphyletic assemblage at the base of the URa3 lineage in this analysis, while BMP2 clusters with T. gigantea and BMP3 to BMP5 all cluster with T. incrustata. The clade named Trebouxia muralis I from Guzow-Krzeminska 2006 groups with T. asymetrica, as was the case in the Muggia et al. 2014 tree. The final named clade in this analysis corresponds to Antarctic B of Romeike et al. 2002, which also includes photobiobts from Australia and Greece. I’ve also redone the matrix of counts for each of these 25 photobiont lineages (excluding the minor ones coloured in black in the tree, but including URa2) across all lichen genera for which data are available. This table can be viewed here, and is also available from the “Association Counts” menu in the header. In total, this represents 1968 symbiotic associations (with the remaining 367 photobiont sequences corresponding to minor lineages). This is obviously an extremely rich dataset and a lot of different questions can be asked about it, some of which I plan to explore in future posts.